Attorney Bill Wells has been Licensed to practice in all State Courts in Texas as authorized by the State Bar of Texas since 1982 and is a Board Certified Trial Lawyer in the field of Personal Injury Trial Law since 1990. Our fee agreement of a 25% contingency fee on all new personal injury and wrongful death motor vehicle accident cases offers our clients reasonable, affordable and exerienced representation. His thirty-two years of experience in the courtrooms across Texas has provided a wealth of experience in representing his clients at the Courthouse. 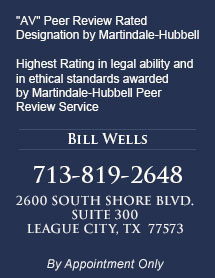 Bill Wells has an "AV" Peer Review Rated designation by the Martindale-Hubbell Peer Review Service, which evaluates lawyers and firms in the United States and Canada, based on the confidential opinions of members ofthe Bar and Judiciary. The "AV" rating is the pinnacle of professional excellence earned through a strenuous Peer Review Rating and is the highest rating in legal ability and in ethical standards awarded by Martindale-Hubbell. For more information on "AV" rating click here. 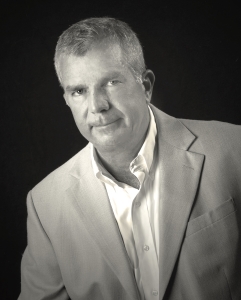 Bill Wells has over 32 years of experience in handling litigation involving cases such as automobile accidents, DWI accidents, trip and falls, uninsured motorists claims, divorce cases, child custody cases, property division cases, family law modification cases, child support cases and many other personal injury and family law issues before Texas Courts. Mr. Wells also handles expunction and nondisclosure cases. Mr. Wells has litigated lawsuits across the State of Texas including cases in Harris County, Galveston County, Brazoria County, Montgomery County, Fort Bend County, Llano County, Travis County, Burnet County, Bexar County, Polk County, Dallas County, Jefferson County, Williamson County, Panola County and Sabine County. If you are unable to make it to our office, we will come to you. Our phone is picked up 24 hours a day and you can always email our office. We can meet with you at your home or in a medical facility. There is no charge for an initial consultation. Our office is conveniently located in the Clear Lake area of Houston, adjacent to NASA, and within a few minutes of Webster, League City, Texas City, Dickinson and the entire Bay Area. *Our office is taking on new personal injury and wrongful death motor vehicle accident claims. In an effort to enable our clients to receive a greater share of their injury claim recovery, our attorney's fee will be limited to 25% of the total recovery. The 25% maximum attorney's fee applies even if we have to file a lawsuit or take your case to trial. Case expenses and any medical liens will be deducted from the client's share of the recovery, if any.